"Through the use of this data, SensorInsight provides detailed environmental and soil monitoring that delivers a better understanding of a farmer’s block or field and how it may affect growth, disease and potential yield,” said Joey Bernal, President of SensorInsight. SensorInsight®, an Internet of Things (IoT) solution provider, today announced the production availability of its new Agricultural Kits for industrial, indoor or urban smart farming. SensorInsight, a trailblazer in the emerging field of IoT, is offering its Internet of Things (IoT) environmental solutions based on state-of-the-art environmental sensor deployments to make incorporating field sensor technology easy. SensorInsight designs are highly cost-effective, solar-powered devices designed to be deployed within a farmer’s field or block and can transmit data for several miles. Agricultural kits come pre-configured and ready to install, immediately providing information directly from the field. The kit works by sending data to the SensorInsight Agricultural platform, allowing farmers to log in and view their data, or start working with their agricultural advisors to better understand growing conditions. Multiple kits can be combined and configured to work with the Agricultural gateway providing a holistic view of an entire farm. The easy to use interface and robust irrigation tools offer the power to visualize and monitor an entire operation in real-time. SensorInsight is also introducing the Industrial Weather Kit. This kit provides comprehensive real-time weather information in a compact packet. The industrial solid-state weather station includes 12 weather parameters to keep users informed of local conditions on the farm or business location. Having a local weather station provides important information such as Degree Growing Days and Evapotranspiration calculations from conditions as they occur in the field based on smart weather sensory technology. 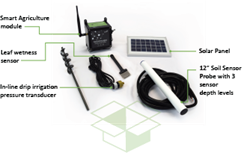 These industrial weather kits can be ordered with 4G communication directly from the weather station or designed as an add-on-node to work with your other kits such as the Industrial Agricultural Solution. Headquartered in Houston, Texas, SensorInsight® creates and markets an Industrial Internet of Things (IIOT) platform designed to provide insight across specific domains, including energy and utilities, transportation, manufacturing, healthcare, and smarter cities. The platform works by providing deep analytics and complete access to an organization’s existing data systems in real-time. SensorInsight® industry packs provide tailored domain specific reports, alerts and analysis based on common issues for a particular industry. For more information, see http://www.sensorinsight.io and follow us on Twitter, Facebook and Youtube. Founded in 2000, Element Blue develops end-to-end technology and continuous services to advance the energy and utilities, healthcare, transportation, water, public sector, manufacturing and retail industries around the world. Element Blue also offers Digital Experience solutions to build portals and information sharing platforms for web, mobile and digital signage to attract, manage and coordinate teams and clients. The company makes use of IBM Watson technology to collect, classify and correlate structured and unstructured data across an organization to drive easier access and analysis of enterprise content and records. Element Blue is an award winning solution provider and a leading IBM Premier Partner providing leading edge software solutions. Element Blue service lines include Digital experience with Web/Mobile/Touch screen technology, Leading edge Analytics, Managed Cloud Hosting and Support and Managed Services. Copyright © 2017 SensorInsight.io. All Rights Reserved. All trademarks, trade names, service marks, and logos referenced herein belong to their respective companies.